The family members of Sadhvi Pragya Singh Thakur have decided not to cremate her father unless and until she is granted permission to attend the funeral. Doctor Chandrapal Singh, aged 72, the father of Sadhwi Pragya Singh Thakur breathed his last due to prolonged illness in a hospital at Etawah, Uttar Pradesh, His body has been brought to a village called Lahar in the Bhind District of Madhya Pradesh. The Bombay High Court will tomorrow hear an interesting petition challenging the Constitutional validity of the National Investigation Agency which was constituted by the Union Government to probe all cases pertaining to terrorism. The petition has been filed by Sadhvi Pragya Singh, an accused in the Malegaon case has filed this petition which will be heard by the Bombay High Court on Wednesday. Did NIA offer bribe to name RSS leaders? A petition making a shocking revelation was filed before the Ajmer and Bhopal courts alleging that the National Investigating Agency had allegedly tried to bribe two accused to name three senior RSS leaders in the murder of Sunil Joshi. If the allegations are proven to be true then it could be quite some revelation and it would put the investigating agency is very poor light. The other question is whether the NIA would resort to bribing Rs 1 crore in order to make their case stronger. The petition alleges that the NIA offered Mukesh Vasani and Raj Singh Rs 1 crore as bribe and in return the agency wanted them to take the names of three senior RSS functionaries in the Sunil Joshi murder case. It is also stated that the NIA officials had questioned the two accused in the Ajmer jail between April 16th to April 19th during which this offer was made. 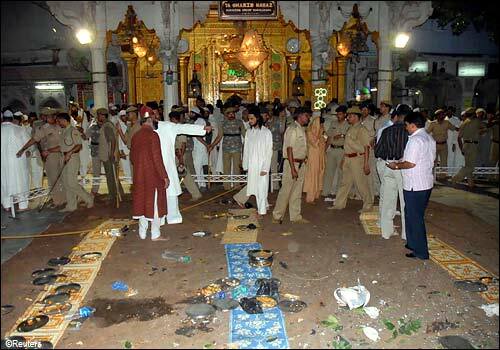 The duo were being questioned for their alleged role in the Ajmer blasts and it is stated that they had procured and planted the explosives at the Dargah. The petition makes further allegations that the accused persons were lured with money and also told that charges against them would also be withdrawn in case they named the three RSS leaders in the case. The NIA is however not taking these allegations seriously. We will reply in court and we know that we have not resorted to any such tactics. At times during investigations, we do tell the accused persons to turn approvers by giving proper information about the case. However the question of luring with money does not arise and that too to create accused persons in the case. Investigating officials also point out that these are age old tricks played by the accused persons which is normally a diversionary tactic. It takes the focus out of the case for sometime and there is delay which helps the accused to buy time. The NIA in this case is on the verge of cracking the Sunil Joshi murder case and there are a couple of senior leaders in the RSS who are likely to be questioned and hence this appears to be a ploy. However a source in the RSS says that this is nothing but a witch hunt by the NIA and they want to show the organisation in poor light. They have been trying to fix some big leaders but are unable to find anything on them. Hence they have resorted to these tactics in order to make their case stronger. The NIA has been created by the ruling party and it is obvious that they would act in accordance to their whims and fancies. Moreover the Congress finds itself on a weak footing for the 2014 elections and hence this is just a build up to show their opposition in poor light. Ganesh Sovani whose client, Sadhvi Pragya Singh who has also been questioned in connection with the Sunil Joshi murder case says that the times have changed today. During the earlier days the police resorted to physical torture to plant information on the accused. Today torture does not work as human rights lobbies are strong and so is the media. Hence monetary allurement is an untried mode possibly resorted to. However I am not amazed by such tactics being resorted to. Sovani also adds that to extract and rely upon a confession of an accused is no longer a safe option for investigating agencies as in most cases it has back fired once the accused retracts the statement. Moreover the investigating officer faces the wrath because more often than not these confessions also get printed in the media. Look at what happened with the CBI in the Swami Aseemanand case. The officer is facing criminal proceedings for leaking it to the media. Hence an allurement in the form of money appears to be an new mode which is being resorted to. The Sunil Joshi murder case has taken many twists and turns. Today he has been blamed for masterminding all the possible terror attacks on this soil. At first it was said that he was murdered by activists of the Students Islamic Movement of India. However the case went into the cold storage and was once again reopened when the NIA took over. During the preliminary round of investigation the NIA is said to have found that he was murdered by his close aides. It was stated that he had too much information on him and was threatening to reveal the same which eventually led to his murder. The case has however not been on fast track and the NIA is trying to get more concrete evidence before it names the accused persons who had masterminded the murder of Sunil Joshi. Author Vicky NanjappaPosted on April 26, 2012 April 26, 2012 Categories TerrorismTags Ajmer, Bhopal, Ganesh Sovani, Mukesh Vasan, NIA, Sadhvi Pragya Singh, Sunil Joshi, Swami Aseemanand, Vicky NanjappaLeave a comment on Did NIA offer bribe to name RSS leaders? An application has been filed in the court of the Special MCOCA court by Sadhvi Pragya Singh Thakur in which she has stated that she be taken in either a 3 AC or 2 AC by rail to Bhopal in connection with the Sunil Joshi murder case. The Sadhvi who is facing investigation for her alleged connection with the Malegaon blasts case was to be taken for interrogation to Bhopal in connection with the Sunil Joshi murder case. 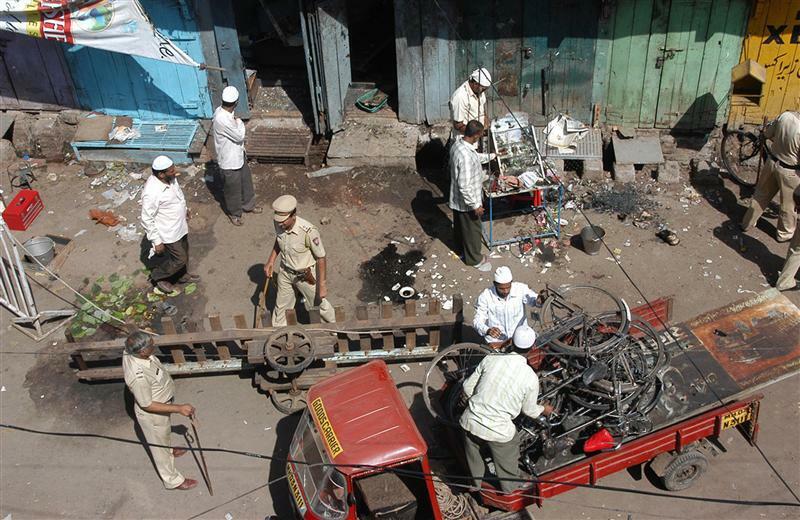 In her application before the court she states through her advocate, Ganesh Sovani that during the course of the investigation into the Malegaon blasts case, the name of Sunil Joshi had cropped up. The matter was taken up by the National Investigating Agency and the matter fell under the jurisdiction of the Bhopal court. On November 24 2011 when her brother in law Bhagawan Bhai had gone to Byculla District Prison to serve her food he came to know that she would be taken to Bhopal by Punjab Mail running on the Central Railway from CST at 07.40 PM. However, since she is a patient of acute lumber spondylitis she told the Jail Authorities not to take her out of Byculla District Prison, unless she is taken by Air Conditioned coach of Punjab mail either of 2 or 3 tier of so that she would be able to undertake the arduous journey with minimum physical strain. However the tickets for an AC coach were not available as a result of which the authorities decided to take her by an unreserved second class. She states that she is ready to bear the expenses of any travel either in a 2 or 3 class compartment and hence a directive be given to the authorities to facilitate the same. She also points out that she should not be forced to undertake such a tedious journey against her wishes. It is the duty of the State to look after my well being and ensure a safe and secure travel and hence the authorities be directed to ensure the same. 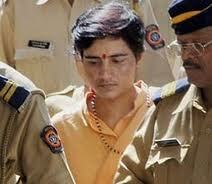 Close on the heels of the bail being granted to 2006 Malegaon blast Accused, Sadhwi Pragya Singh Thakur has moved the court seeking regular bail. Earlier she had moved even the Supreme Court seeking bail but the same was rejected by a Bench comprising Justice J.M. Panchal and Justice H.L. Gokhale on September 9 this year. No ‘specific role’ has been attributed to her, No incriminating thing has been recovered from her. From 10.10.2008 to 22.10.2008 she was interrogated by the ATS only on the point of her (once owned) LML Freedom two wheeler, which is reflected in the Station Diaries maintained by the ATS Police Station at Kalachowki. Girgaum, Moghe, she came to be arrested that is the ‘reasoning’ of her arrest according to ATS itself, which was reflected earlier in the affidavit filed by the then Chief IO Mohan Kulkarni in response to Sadhwi’s ‘bail by default’ pleas filed in HC & SC. However, on 26.11.2008, these two accused had lodged a private complaint against the then ATS Chief Hemant karkare & others before Ld. JMFC at Indore in which they have narrated the manner in which they were assaulted, beaten up, threatened and intimidated by the ATS Officers even at Indore i.e. on the soil of the MP and also at ATS Kalachowki and forced them to confess before Addl. M.M. at Girgaum. She has also sought a parity since three other accused (Sahu, Kalsangrah & Rahirkar) of 2008 blast have been granted bail by HC. This case would now be heard on December 5th after the NIA would file its reply, her advocate Ganesh Sovani informed.